The cross-border reputation of higher education institutions is established through a two-stage filtering system, with international accreditations providing access while acting as “certifiers” and international rankings defining the relative competitive position. The interrelations between accreditation and higher education become especially evident in the field of business and management education. A variety of mandatory accreditations (national) as well as voluntary assessment schemes (international) have emerged and challenge business schools while driving substantially their institutional strategies. In order to better illustrate the role of accreditations in the sustainable development in higher education, this entry focuses on the group of business and management schools and their responses to accreditation standards and criteria. Business schools are not much different from other institutions in the higher education industry, and much can be learned from the management education sector and applied in universities (Petriglieri 2015). Although accreditation is not the only factor that determines what business schools believe, do, and become, it is certainly an important shaper of the direction of travel in the face of the twenty-first-century management education imperatives. This has especially become the case since the integration of a strong ethics, responsibility, and sustainability narrative (Maclean et al. 2015) in the prestigious European Quality Improvement System (EFMD) accreditation, as well as for business schools’ eligibility to Association to Advance Collegiate Schools of Business (AACSB) accreditation. Until today, a comprehensive and constructive dialogue in business schools, as well as within the wider community, seems to be missing (Powell et al. 2016). Therefore, the role of accreditations such as EQUIS is of particular importance as they drive business school developments. While EQUIS in the past had focused on internationalization and corporate relations, the accreditation body added a third transversal standard “ethics, responsibility, and sustainability” in 2013 (EFMD 2016). The management education sector is perceived as slow adaptors to the responsibility and sustainability agenda. Despite some visible activities, there is evidence that responsible management education remains largely as an “unfulfilled promise” (Cornuel and Hommel 2015). Recent literature and research have been critical about business schools’ integration of ethics, responsibility, and sustainability into their teaching and research activities, and the majority of institutions are continuously challenged by internal resistance and resource constraints (Aspling 2013; Ghoshal 2005; Alvesson 2013; Muff et al. 2013; Cornuel et al. 2015). It is therefore widely argued that business schools continue to deliver a narrow view on responsible management education, while many of their primary stakeholders, such as students, governments, and companies, demand a greater sense of purpose (De Onzono 2011). Within this context, national and international business school accreditations play a dual role in the development of a more responsible and sustainable management education. While accreditation bodies arguably had its share in business schools’ narrow-minded approach to research and education in the past, it also plays an important role by driving processes and acting as a change agent in business schools’ development (Canals 2010). Business school accreditation has its roots in the United States (Khurana et al. 2005). Since the early twentieth century, accreditation has been the main monitoring regulator of North American business and management schools, with predefined quality standards in various academic areas and being administered by independent, nongovernmental organizations (Locke 1989; Porter and Mckibbin 1988). The most important and oldest American accreditation body is the Association for the Advancement of Collegiate Schools of Business (AACSB), which has been accrediting business schools for over 100 years. The rise of accreditations and assessments during the 1980s can be seen as part of a larger societal trend. In a world that is increasingly characterized by variations and differences, accreditations are one way to bridge those differences and facilitate the flow of information (Thomas and Cornuel 2012). Additionally, assessment criteria and audits are considered as a reaction to the evolving risk society (Hood 2004), with its increasing demand for transparency and accountability, which appear in parallel with increasing access to higher education through globalization and mobility (Power 1999). Moreover, the emergence of new regulations has been further analyzed as an aspect of rationalization in higher education that is increasingly challenged by growing competition and deregulation (Moran 2002). Other scholars suggest that the growing importance of accreditations could rather be described as a fashion in the search for additional certifications, standardization, and quality assurance systems, all in order to achieve differentiation in competitive, globalized markets (Meyer 1994; Hood et al. 1999; Engwall and Morgan 2002). However, the pressure in higher education – resulting from internationalization as well as the intensification of transnational competition – led to an “explosion” of regulations that is challenging national accreditation systems (Djelic and Sahlin-Andersson 2006). Picking up on demands for more transparency as well as comparability and market information, accreditations have been developed as a response to market pressure that is coming not only from consumer groups but also from competitive forces in the business school accreditation market (Hedmo et al. 2001; Beehler and Luethge 2013). In this context, New Public Management (NPM) has created the environment and the imperatives for business school accreditation. Management literature and research has widely discussed how accreditation bodies can ensure an impact on business schools’ quality, while balancing their mission between membership interests and the enhancement of (accreditation) standards (Rasche and Gilbert 2015; Starkey and Tiratsoo 2007; Vas and Lejeune 2004). Understanding how accreditation bodies and schools interrelate and affect each other is key when it comes to explaining how accreditation standards have been developed. The reciprocal relations explain the interwoven processes and expansion of regulations, framed by voluntary agreements between regulators and regulatees (Moran 2002). In this context, it is important to recognize the multilevel governance concept of accreditation organizations, which captures the interrelatedness of regulatory actors and those that are regulated (Majone 2002). Following Bourdieu’s notion of the organizational field, it can be said that there is a common belief in the importance of management education by various actors (Locke 1989; Porter and Mckibbin 1988); however, at the same time, those actors disagree on how to define, assess, and develop the activities (Bourdieu and Nice 1980). It is necessary to point out the complexity of interrelations, political struggles, and collaborations when explaining the correlation between different actors in management education (De Onzono 2011; Majone 2002). The intertwined management education providers, accreditations, and monitoring bodies develop in relation to each other, and, as a result, the entire field has become a “regulatory knot” (Hedmo et al. 2001). Accreditations act as an interface between the higher education sector and industry, companies, and public organizations. From this vantage point, accreditation is required to translate expectations from the public and private sectors into its accreditation standards, which apply to ethics, responsibility, and sustainability (ERS) as much as to all other important aspects of education (Naidoo and Pringle 2014). Having a diverse and large group of international members provides accreditations with a unique position and access to different key players. The organization should link these “partners” in a joint effort to develop and fully integrate ERS in management education. Through strengthened commitment to ERS, accreditations would identify those institutions that deliver high quality in ERS/RME in different geographic areas, which would signal the importance of these topics within the business school sector and provide immediate benchmarking opportunities. In 2012, following the global economic crisis and the resulting stakeholder pressure (Rasche and Gilbert 2015; Thomas et al. 2014), accreditation bodies such as EQUIS revised their standards and criteria in 2013 and established far-reaching requirements to integrate ethics, responsibility, and sustainability (ERS) transversally into all major areas of business and management education (Thomas et al. 2013) (see Fig. 1). The changes imply that responsible and ethical behavior should be an integral part of a business school’s values as well as strategy and should be reflected in all of its regular activities. The transversal accreditation standards also established definitions for ethics, responsibility, and sustainability applicable for the management education sector. But also AACSB introduced new criteria for responsible management education in their 2013 revised Business School Accreditation Standards (AACSB 2015). By linking responsibility and sustainability to the initial eligibility phase, AACSB expects substantial developments to be in place prior to a school entering the accreditation process. One of the guiding principles is that “The school must encourage and support ethical behavior by students, faculty, and professional staff” (AACSB 2011, 2015). A strong commitment to corporate and social responsibility is demanded, and “The school must demonstrate a commitment to address, engage, and respond to current and emerging corporate social responsibility issues (e.g., diversity, sustainable development, environmental sustainability, globalisation of economic activity across cultures) through its policies, procedures, curricula, research, and/or outreach activities” (AACSB 2015). Debates around the importance of responsible management education arrived in the epicenter of business schools only following the eruption of the economic crisis in 2007 (Muff et al. 2013; Starkey et al. 2004). Business schools began to understand that continued demand for management education and market growth is not in itself an adequate indicator of the value and success of management education (Thomas et al. 2014). Many different approaches have encouraged reconnecting management education with business and society. Buzzwords such as corporate social responsibility, corporate citizenship, business ethics, social entrepreneurship, corporate sustainability, and conscious capitalism are widely used and common in the marketing and communication plans of business schools (Holland 2009; Cornuel and Hommel 2015; Gosling 2003; Mintzberg 2004; Naidoo and Pringle 2014). However, besides the many commitments and discussions, Dyllick (2015) argues that most business and management schools continue to teach biased content in business functions, often ignoring the fact that these functions have negative effects on the sustainability performance of companies (Bondy and Starkey 2014). Many management education institutions also dismiss public interest in favor of private interests (Muff 2013). In this context, the definition and understanding of responsible management education depends largely on cultural background and values. Therefore, it is not surprising that concepts of ethics, responsibility, and sustainability are interpreted differently throughout the management education world (Nohria and Khurana 2010), which created a challenge to accreditations that needed to assess the school’s performance also in this sector. While on one hand accreditations provide guidance and pressure business schools to integrate ERS in their strategies, governance, research, curricula, and extracurricular activities (Rasche and Gilbert 2015), on the other hand, the rising importance of responsible management education and learning (RMLE) has led to intra-institutional tensions as well as created resistance toward the development of a more responsible management education (Cornuel and Hommel 2015). Scholars such as Muff (2013) and Thomas et al. (2013) argue that the strong relationship between regulatory agencies and regulatees may even limit accreditations to be the visionary leader in business schools’ change processes. In response to the global economic crisis, European management education received coercive, mimetic, and normative pressures from both internal and external stakeholders, which forced business schools to adapt and implement further elements of responsible management education. Coercive pressure is channelled through national and international accreditations and other certifications and is immediately linked to a school’s reputation and resource dependencies. In particular, public business schools were forced to adapt to external regulations in order to maintain or increase funding (Powell and Dimaggio 2012; Campbell and Pedersen 2001). International business school accreditation agencies are considered as one of the important sources of coercive pressures for responsible management education (Rasche and Gilbert 2015). Although the accreditation standards give room for interpretation, business schools cannot ignore their call for responsible management education (Scharmer 2009), as accreditations act as an important source of legitimacy (McKiernan and Wilson (2014). According to Wilson and McKiernan (2011), one or a combination of coercive, mimetic, and normative pressures has led to some of the current aspiring or accredited schools to address demands for responsible management education by creating only isomorphic changes. Through this, business schools may signal their “belonging to the club of EQUIS-accredited schools” by sharing social values and gaining legitimacy in the eyes of internal and external stakeholders and society at large through isomorphic behavior such as decoupling (Kraatz and Zajac 1996; Campbell and Pedersen 2001). Those schools risk further damage to their reputations and to lose their legitimacy (Powell et al. 2016). There is much to learn from business schools and the recent accreditation developments alike. Future debates on responsible management education will be informed through sights from research, which help the entire higher education sector as well as accreditations to further guide their ERS/RME developments. Forces in favor and against are in play, and accreditations can in this regard count on strong support from a number of business schools committed to responsible management education (Waddock et al. 2010; Rasche and Gilbert 2015; Forray and Leigh 2012). It is therefore important to keep the quality assurance denoted by accreditation in balance with the invitation for more schools to belong, participate, and create value that aligns with the sustainable development imperatives of our times (Zammuto 2008; Solomon et al. 2017; Beehler and Luethge 2013). But what are the implications for accreditations and the wider business school community? While empirical studies support business schools in their self-assessment and in outlining future strategies related to a more responsible management education, studies also indicate a need for stronger cooperation between business schools that allows benchmarking and jointly developed ERS actions (Rasche et al. 2013; Maclean et al. 2015). However, also the accreditation bodies need to further assist business schools in their RMLE developments. Business school accreditations play an important role as they set the tone, define priorities, and guide changes in management education (Hedmo et al. 2001). With its unique positioning as an international regulatory and member organization, accreditations can directly influence the strategic directions of business schools. With its mandate and role in society, accreditations should foster a sense of global responsibility in business schools and thus contribute substantially to the well-being of societies around the globe (Naidoo et al. 2011). 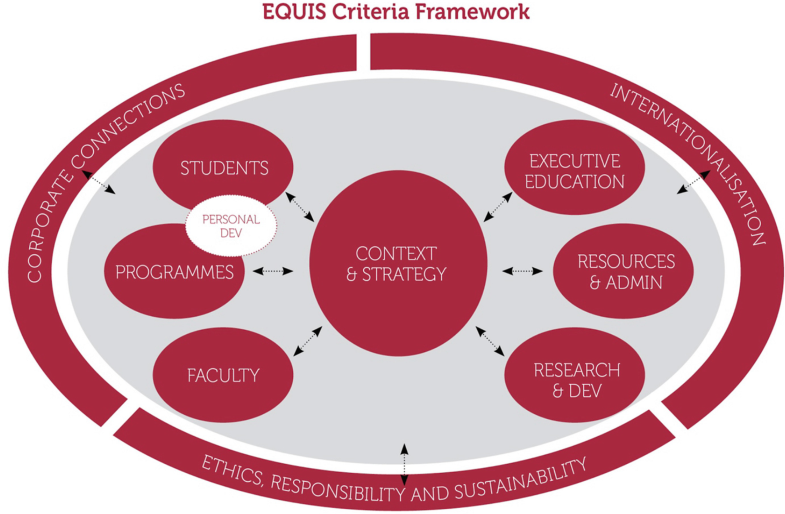 As the EQUIS accreditation standards established strong references to ERS, they also need to provide guidance to business schools in the development of responsible management education. Equally to its focus on high-quality developments in internationalization and corporate connections, EQUIS must give ERS the same degree of importance. Accreditations and business schools should define jointly how to measure quality in ERS and distinguish between schools that “walk their ERS talk” from those that decouple their RME commitment from actions and only engage in isomorphic changes (Bromley and Powell 2012). Consequently, business schools that go through the accreditation process will need to provide clear evidence of their ERS developments. In addition, accreditations would provide support to fill the “know-how gap” by informing schools on how to measure ERS quality and providing benchmarks and better practice models. In cooperation with other organizations and business schools, accreditations should provide learning platforms where institutions can exchange RME experiences and practice. Therefore, accreditations should be more rigorous in the assessment of ERS actions and help schools to shift their attention from “ERS talk” to “ERS action.” If accreditations and business schools do not work together to define quality indicators and monitor ERS performance and impact, the standards will remain subject to individual interpretation. Without this critical step, the process may not lead to the change necessary to respond to modern economic, social, and environmental challenges. In summary, if accreditation organizations do not respond to the criticism from business schools, they also risk being considered as “not walking their own talk” by decoupling accreditation standards from the assessment and regulatory activity (Rasche and Gilbert 2015). With support from EFMD and other important organizations in the field, business schools may advance further toward responsible management education. Business schools can change further and become more ethical, responsible, and sustainable, but in order to do so, business schools together with accreditations, rankings, and other regulating agents need to cooperate to further develop the current RMLE agenda (Starkey and Madan 2001; Skapinker 2011). A stronger sense of accountability will help the responsible management education sector evaluate those activities and measure the real impact and advantage they provide for the society at large (Powell et al. 2016). This will require business schools and accreditations to further reinvent themselves and find a common purpose for their existence, which includes a radical rethinking of management education paradigms (Naidoo et al. 2014). Business schools are at a “tipping point” where they must reconnect with their primary responsibilities by serving the needs of their societies (Thomas et al. 2013; Hommel et al. 2016). In transforming to more responsible management education, the schools will have to approach a number of institutional changes that will eventually lead to more ethical, responsible, and sustainable management education. Therefore, management education will have to embrace disruptive change as opposed to the incremental change we have largely seen in the past. The schools, with support from the accreditations, may review the research practice to improve the relevance and impact of their academic as well as applied research. Equally important, business schools must continue changing their curricula, which will require advanced teaching skills in critical and integrative thinking to help students to become management innovators. By changing their own paradigms, business schools will be able to change toward more responsible management education, and by doing so, they can become the interface between the higher education sector and the society that demands this change.